A perfect scene to commemorate these wintry days -- and the only snowglobe you need. Snowglobes tend to be pretty same-old, same-old: the little Dickensian cottage, the glowing windows, the dull-eyed snowman. 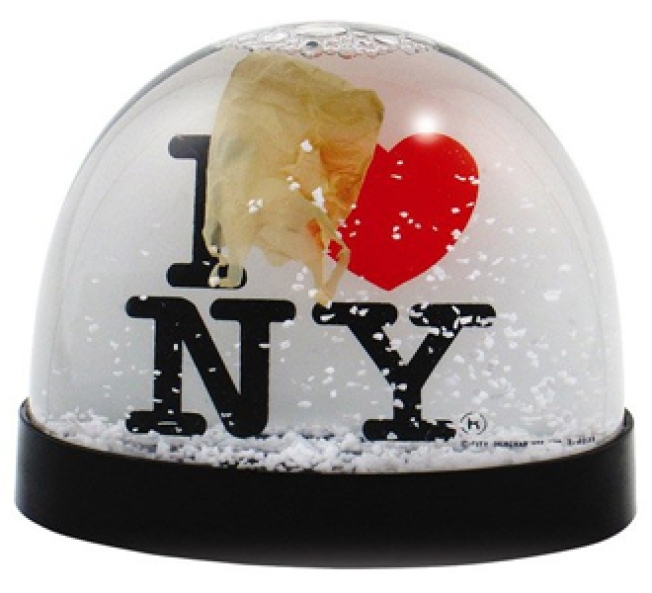 But this globe designed by Andrew Coates for the Cooper-Hewitt Museum gives us a serious case of the warm fuzzies, and should capture the imagination of anyone who's trudged through Gotham in a blizzard: against the iconic "I Heart NY" backdrop, snow falls, and a tiny plastic bag gets whipped around by the wind. It's funny 'cause it's true -- and delightfully New York. Available from NewYorkFirst.com for $29.